appeared here but has been updated to more thoroughly identify what each item on the list is for. It’s hard to believe, but we’ve had Nigerian Dwarf goats for nearly ten years. We started with two, and are trying to keep the herd down to less than fifteen today (yes, that number keeps increasing). However, I still remember when they first came home, when I worried and wondered if we’d prepared and had the basics needed for them. We’ve been very fortunate and had few instances of serious problems with the goats, and the few times we’ve had issues, we’ve had the supplies to get through. A few times it’s been necessary to get a Vet, but at least we’ve had the supplies available to keep things from becoming a disaster until we could get to the Vet (or the Vet get to us). 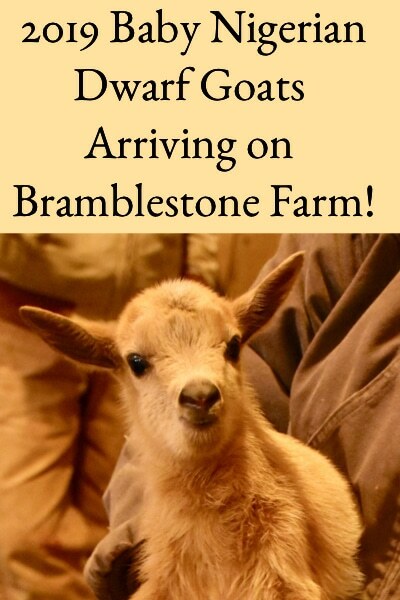 So, I highly recommend supplying yourselves before getting goats, and as we were preparing for them, one of my biggest questions was what I should have on hand. This was the list I used to prepare for Tinkerbell and Honey (some of these things are obvious I know), updated after quite a few years of experience. 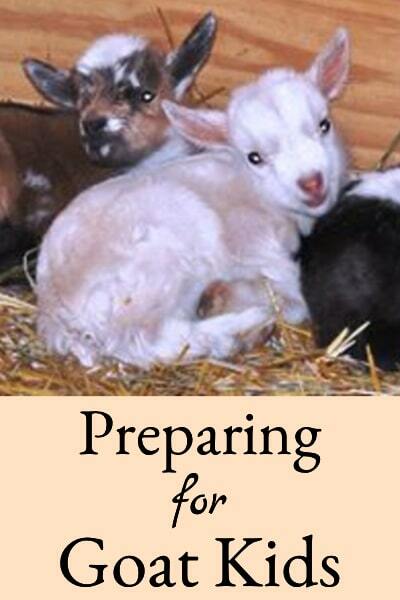 Note, these are just the basics to consider having for care and maintenance of young does or wethers, there are additional supplies to get for bucks, pregnant (see Goat Kidding Supplies) or lactating does, and kids. Veterinarian’s Contact Information – The first thing that I suggest prospective owners have firmly in place, is the phone number of a veterinarian, especially one that makes farm visits (even in the middle of the night) and that is familiar with goats (preferably the breed of goat that you have). Since it will probably be necessary to visit that veterinarian at some point, try to find one that is close to you. 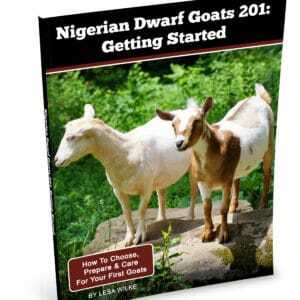 Shelter – Nigerian Dwarf goats (or dairy goats in general) cannot withstand wind, don’t like to get wet, and must be protected from predators, so some type of shelter to protect them from these things is necessary. In some situations and climates, a three-sided shelter with a roof might be all that is required while in others, a well-designed barn is a much better option. Fencing – Goats should never be tethered because they cannot protect themselves from predators or the weather and they may injure themselves. Tethering a goat is like offering a meal to a hungry coyote, feral dog, bear, or other wild predators because the goat cannot run away. Additionally, they can’t seek shelter if the weather turns nasty. Finally, there have been too many stories of goats hanging themselves when tethered. 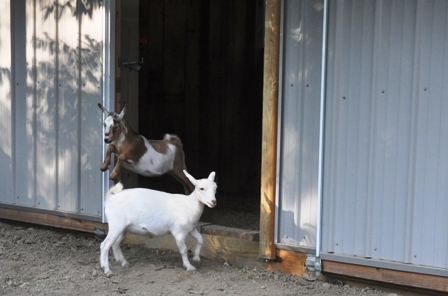 Goats should, however, have access to outside areas to roam which typically means creating a pasture area by installing fencing. Permanent fencing is a long-term investment, so it pays to do some homework and make sure it’s done right the first time. Good fencing for goats is abundantly important so do not underestimate it. They really do seem to delight in finding a way to escape! Bedding Material – Within the goat shelter or pens, a bedding material should be used to help soak up urine and to keep the goats from lying directly on the flooring surface. Straw or pine shavings are frequently used for this purpose because they are absorbent and relatively inexpensive. In cold winter areas, it’s common to let the bedding material build up to a fairly thick layer to help maintain warmth. Cedar shavings should not be used as they are bad for their respiratory system. Collars – Easy to take on and off because you only want the collar on when using the leash. You don’t want to leave the collars on them (or they may hang themselves)) unless you’re using break-away collars. Leashes – Get more than one if you’re getting multiple goats. 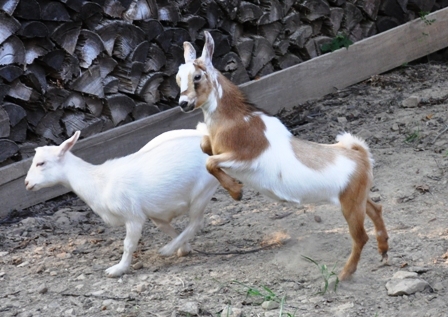 Most goats are relatively easy to teach to walk on a leash. Food Dishes – These are for feeding goats their grain portion and you will need to feed them separately so you can determine how much each goat eats. Hay – preferably the same type of hay they were eating at their previous home at least for starters. 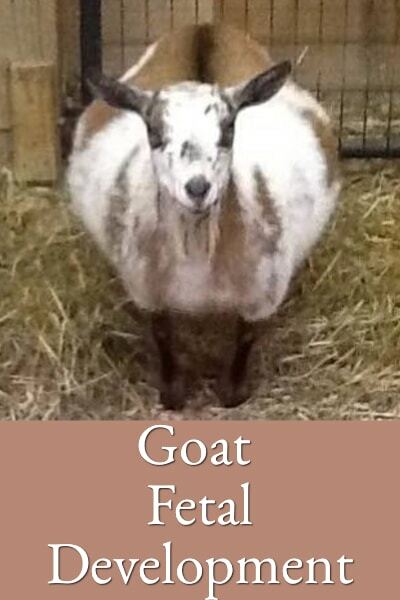 You should never suddenly change a goat’s diet or they may bloat and die. Hay Bins or Bags – to hold the hay up off the ground as they eat, but note that they’ll still waste a lot on the ground. Also note that once it hits the ground and possibly contacts manure you cannot reuse it, you should discard it. Goat Grain (goat concentrate) – again preferably what they were previously eating, at least to start. Weight Scale – To measure how much feed they’re getting. Black Sunflower Seeds – This is used by some goat owners to top dress the goat grain to provide vitamin E and selenium. Goat Mineral – They should have access to free choice goat minerals at all times. Baking Soda – Offering free choice baking soda is recommended allow goats to self-regulate their rumen function and prevent bloat. Soda/Mineral Feeders – Feed dishes to hold the goat mineral and baking soda so that they can access them free choice. These are usually attached to the wall inside the goat pen. Goat Treats – To get them moving in the right direction (ours will do almost anything for an animal cracker). Have animal crackers, carrot sticks or peanuts on hand. They are all commonly used as goat treats. 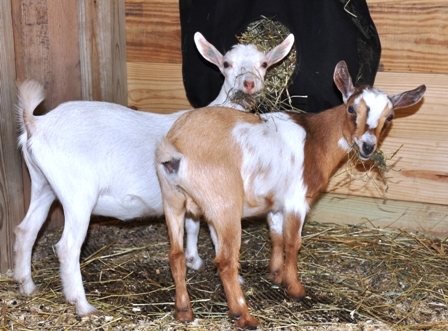 Watering Buckets – Smaller one gallon buckets are big enough for Nigerian Dwarf goats. There should be a bucket of water in each pen or pasture area so they have continuous access to water if they want it. If you live in colder weather regions, heated water buckets are very useful. Clippers – The goats will need clipping in spring when the weather starts to warm up. It’s a good way to help prevent or eliminate lice. Grooming Brush – Once introduced to grooming, most goats enjoy it. Like clipping above, it is a way to eliminate or prevent lice. Hoof Trimmers – Depending on the terrain on which they walk, goats usually need hoof trims about once a month. If they’re on rocky terrain, then they may need trimming less frequently. Blood Stop Powder – This is a powder used to stop the bleeding when a goat’s hooves have been trimmed too aggressively. Rectal Thermometer – This is really a must because one of the easiest ways to tell if a goat is sick is to take its temperature. Digital rectal thermometers are inexpensive and quick, which makes them your best bet when trying to get the temperature of a wiggly goat. Syringes – Luer lock 3 ml and 6 ml syringes will cover most needed injections. 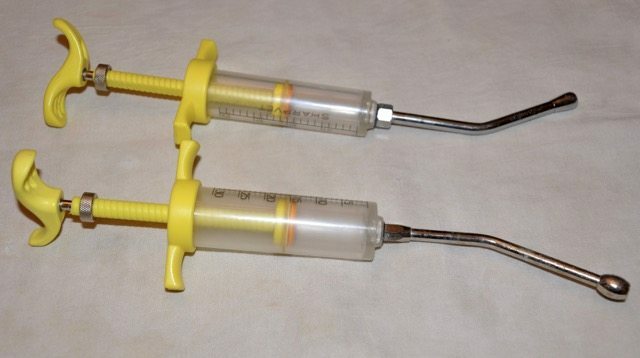 These smaller syringes are appropriate for dosages sized for Nigerian Dwarf goats. Needles – 20 and 22 gauge needles (the larger the gauge, the finer the needle) in 3/4″ to 1″ lengths usually handle any injections that they need. The larger 20 gauge needle should be used for thicker injectables. Drencher – A 20 or 30 ml drencher is indispensable for administering drugs or dewormers orally to goats. Activated Charcoal – This is used to absorb toxins when a goat has consumed something poisonous. Hopefully, it’s something that you’ll never need, but if you do, it’s probably too late if you don’t already have it on hand. Available from caprine or livestock supply sources, the dosages vary depending on the brand so follow your veterinarian’s instructions or those shown on the label. 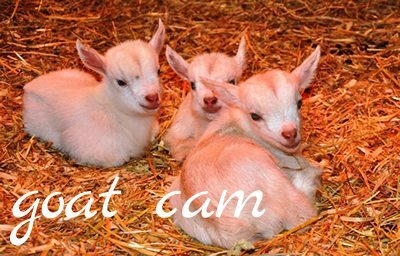 Baby Aspirin – Baby aspirin is given to goats to relieve pain (when goats are in pain they grind their teeth), lower a high fever, or reduce inflammation. To administer baby aspirin, simply dissolve it in warm water and give it as an oral drench. Make sure to use real aspirin. Ibuprofen and Tylenol should NOT be used for goats. Electrolyte Mix – These powdered products are used to re-hydrate sick goats. They can be mixed with water and used as an oral drench or can be mixed into the drinking water. Milk of Magnesia – This is a laxative used to relieve constipation, a toxic reaction, or other indigestion from overeating or improper feeding. It’s important to make sure the goat stays well hydrated when taking a laxative. If necessary, use in conjunction with the electrolyte mix. Goat Nutri-Drench – This is a supplement that supplies quick energy to stressed goats. It contains the vitamins, minerals, and nutrients to help a sick goat recover from illness. Follow the instructions on the label for dosages. Probios or Probiotics – These are two name brand products that reintroduce beneficial organisms to the rumen, aid digestion, and help maintain proper rumen function. It’s highly recommended that the product is used after any antibiotic treatment (the antibiotics kill the beneficial micro-organisms in the rumen), after treatment for diarrhea, and in any situation which causes the goat(s) stress. These products are in a paste form that can be administered by smearing the paste on the roof of the goats’ mouth. There is also a tool that looks like a caulking gun that can be purchased to administer the paste. Vegetable Oil/Corn Oil – This is used to “get things moving” if a goat has gotten into the grain and gorged. Hopefully, if this has happened, you catch it before the rumen becomes impacted. It can also be used to ease constipation. Important note: Mineral oil is NOT a suitable substitute because it has no taste and goats may aspirate it into their lungs. Vitamin B Complex – This complex is available from caprine or livestock supply sources and is used to stimulate the appetite of goats that are not eating. This is administered subcutaneously (aka SQ) which means via injection just under the skin. Antibiotics – It’s a good idea to have a couple of different antibiotics on hand that can be used for a variety of conditions. Two that are often recommended are Procaine Penicillin (Penicillin G or Pen G) and Biomycin 200 (Oxytetracycline). Beginning in 2017, some antibiotics are available only by prescription. Procaine Penicillin G – This is administered subcutaneously (SQ) or intramuscular (IM). It should be refrigerated and it has a 5 day milk withdrawal time. Biomycin 200 (Oxytetracycline) – This is administered SQ and this version of oxytetracycline doesn’t sting as much as others (LA-200, etc.). This has a 10 day milk withdrawal time. Spectrum Scour-Halt – This is an antibiotic used to control diarrhea that has not been caused by coccidia in goat kids. It should not be used for adult goats. Toltrazuril – This is used to treat coccidiosis and can be ordered at this LINK. It is administered orally, should be refrigerated, and is the drug many choose for treating a coccidia outbreak. BoSe – Many areas of the United States are considered selenium deficient and this prescription drug is given to goats living in these areas to prevent problems caused by selenium deficiency. C&D Antitoxin – This is given to try to save a goat that developed enterotoxemia (overeating disease). It is administered SQ and should be refrigerated. It’s best to try to prevent the disease by giving a C/D & T shot annually (see below), but it’s critical to have this on hand if a goat develops the disease because you probably won’t have time to purchase it and still save the goat. Five days after using the C&D Antitoxin, the goat should receive the C/D & T Toxoid (below) and then in 30 days to provide long-term protection. C/D & T Toxoid (Clostridium Prefinges Type C & D and Tetanus) – This provides yearlong protection from overeating disease (types C & D) and tetanus. It’s recommended that all goats be given a shot annually. The toxoid should be kept refrigerated. It’s not uncommon for an abscess to develop at a C/D & T injection site, so the armpit region (region behind the base of the front legs) is often the preferred site for C/D & T vaccinations. Tetanus Antitoxin – This is used for immediate treatment of tetanus. Tetanus is fatal if not promptly treated so it’s best to have it on hand. It’s available in a single dose 5 ml vial that should be kept refrigerated. Five days after this is used, the goat should be re-vaccinated with tetanus toxoid or the C/D & T toxoid (the two injection series given 30 days apart) to prevent disease for the next year. Dewormers – Some dewormers are no longer effective in many parts of the country and most dewormers will not treat all of the possible internal parasites of goats, so it’s a good idea to have several on hand. Almost all dewormers are best given to goats orally as a drench when treating internal parasites. Deworming is most effective when repeated in 10 – 14 days to catch any larvae that hatch out after the first treatment. For milking does, be aware that there is a different milk withdrawal time associated with each dewormer. 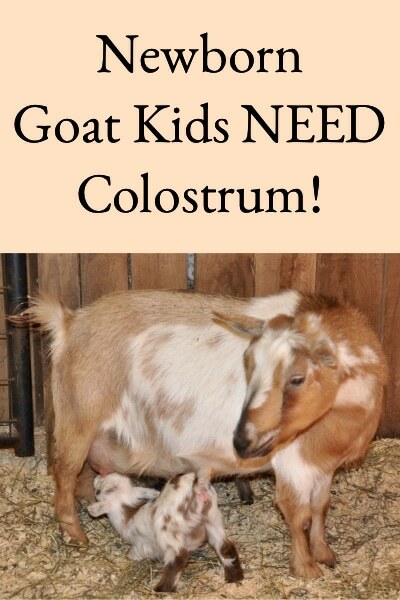 Copasure Bolus – Copper deficiency is a documented problem for goats in many areas of the United States and other countries. Copper boluses were developed to treat copper deficiency and are available in 2 and 4-gram bolus sizes suitable for Nigerian Dwarf goats. 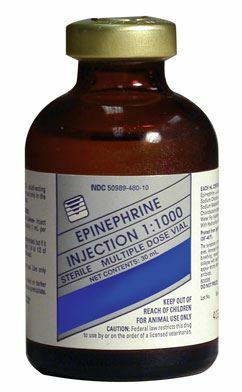 Epinephrine – This is a prescription drug that every goat owner that gives injections should have on hand. When given an injection, a goat can go into anaphylactic shock (immediate collapse), and the only way to save it is to administer this. Always have it on hand and be ready to use it when giving injections. You won’t have time to go get it if a goat goes into shock. The dosage is 1 ml SQ or IM per 100 pounds. It should be refrigerated. For those of us “goaters’ of the future, it would have been nice to have some links to the products you recommend: Locations are all different, and some stores are in certain areas of the US but not others. I know Amazon has many different items, and a link to the products would give some of us an idea of what to get. Thank you for the wonderful and complete list. Also, are some of the ‘medications’ listed available as herbal options? I know that some are not, but you’d think that some of the listed items could be substituted with herbs, essential oils and homemade products. Hi Carol, Your suggestion of providing links to the products to give folks a better idea of what we’ve found works is an excellent one. Thank you! I’ll try to improve the list with links to items in the near future. The herbal options question is probably at least another blog post, there are lots of different thoughts/options out there. Hi, I am Anita, just subscribed to your newsletter and have not gotten off the computer yet, lol. It is so interesting and informative. 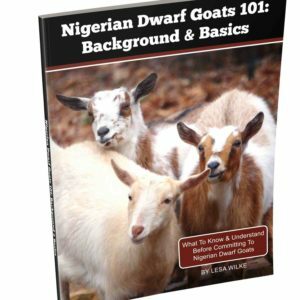 I am wanting the Nigerian Dwarf Milk goats and trying to ingest all the information I can. I bake our own bread, etc. every week and want to use goats milk. Do you make butter from the goats milk? There isn’t much fat in their milk, so was curious. Thanks for the awesome list! My kids and I are dying to get some Nigerian dwarfs, but I’m a little daunted to say the least! You’re welcome Jessica, remember you don’t have to get it all at once, my collection of supplies has grown (is growing) over time. What is the baby aspirin for? Baby aspirin is given to goats to relieve pain (when goats are in pain they grind their teeth), lower a high fever, or reduce inflammation. The dosage is one baby aspirin for every ten pounds of weight and it can be given every four hours. To administer baby aspirin, simply dissolve it in warm water and give it as an oral drench. Make sure to use real aspirin Ibuprofen and Tylenol should NOT be used for goats. If you ever get a moment and don’t already have the uses for each item on your kidding list, would you be able to do that someday? picking up my 1st set of kids this weekend and want to be thoroughly prepared! I will try to add the uses in on the items that don’t have them listed Judy – it will probably not be for a couple of weeks but I will add them in. Thanks for the push to make this a better list! Where is best place to buy goat supplies? 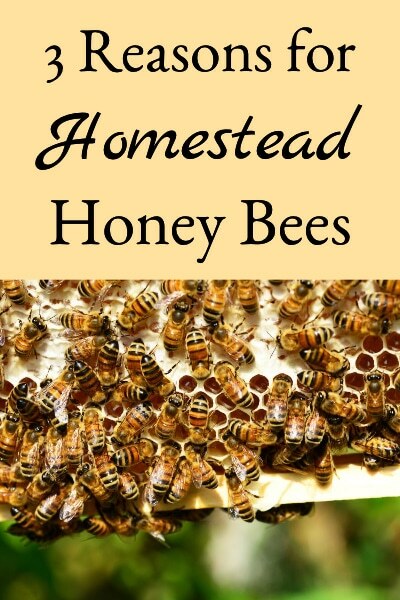 It’s hard to specify one best place, so here’s a listing of suppliers and their links to check out: http://www.betterhensandgardens.com/animal-health-supplies-sources-links/ For equipment like clippers, hoof trimmers, etc., I like Premier – their stuff isn’t inexpensive, but it works well and lasts. For things like health and milking supplies, I tend to go with PBS animal health or Jeffers. PBS is convenient because it’s about 20 minutes away, and Jeffers usually has some of the best pricing. Hope that helps. Great tips. We are going to be getting a few goats this spring. We haven’t determined the breed yet. Hi Allison, I’m glad you’re investigating first to prepare for them, it makes it so much easier. Good Luck and I hope you find the perfect breed for you. Nice list for beginners, Lesa. I wanted to know if you still use hay bags to feed your hay. Thanks! Thanks Erin, we do still use hay bags, I put the hay bags outside (under a covered overhang) each morning to encourage the girls to spend the day outdoors (they’re free to go in and out of their stalls) and then bring them in at night. I’m looking for alternatives that make life easier and waste less hay, how do you handle it? I suppose those hay bags wouldn’t be any good if the goats have horns ?? I just have hay racks outside in their enclosure. I have 3 of the wire ones from Hoegger’s, and two from Sydell that are plastic and have holes in them. I don’t put them in their mini barn and shed. I see a lot of cool ideas on Pinterest, but haven’t persuaded my husband into building a neat hay rack yet. Since you said you used haybags, I wondered if you had less hay falling on the ground. I doubt it Erin, they’re pretty good at spreading hay all over the ground. How much Black Oil Sunflowers Seeds should a bred Nigerian Dwarf be getting a day?? Hi Janet, for me that depends a lot on where a doe is in her pregnancy. If she’s no longer being milked, then I don’t feed goat food (and BOSS) until about six weeks before she’s going to deliver (because I don’t want the kids to get too big). 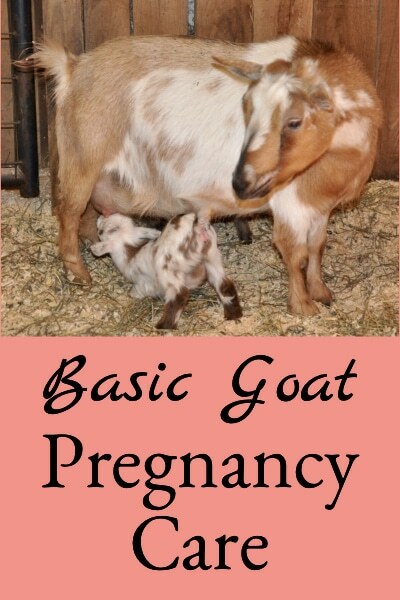 They do get all the free choice goat mineral they want throughout pregnancy, and mine really seem to love it. At six weeks, I will gradually start introducing her back to grain and I top dress with BOSS. So, very little at first, and then I base the amount of grain and BOSS on each doe. But the BOSS always remains a pretty small amount. Thankyou Lesa that is very helpful. Some cities have begun to allow Dwarf Nigerian does because they don’t really take any more room than a medium to large dog. Thank you so much for this list!!!! On BYH, there are so many things that are just emergency things, and these are just things you will actually use. 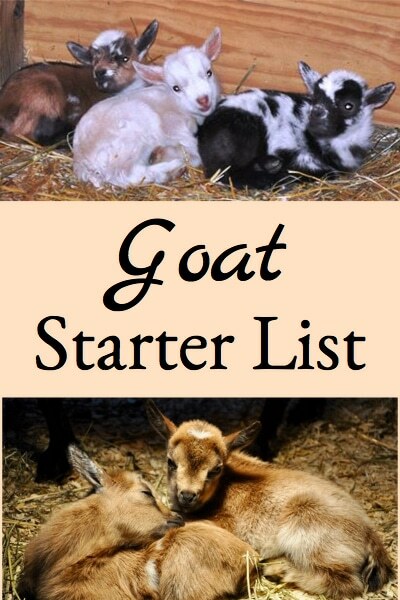 If I ever do get goats, I’ll be using this list!!! Glad if the list helps anyone get going, and I’m sure hoping you do get your goats and sheep, the goats at least I can say are great! And I can definitely second that!